The first seven Dead Sea Scrolls were discovered by chance in 1947 by Bedouin of the Ta’amra tribe, in a cave (later given the name “Cave 1”) near Khirbet Qumran on the northwest shore of the Dead Sea. Three of the scrolls were immediately purchased by archaeologist Eliezer Lipa Sukenik on behalf of the Hebrew University; the others were bought by the Metropolitan of the Syrian Orthodox Church in Jerusalem, Mar Athanasius Samuel. In 1948 Samuel smuggled the four scrolls in his possession to the United States; it was only in 1954 that Sukenik’s son, Yigael Yadin, also an archaeologist, was able to return them to Israel, and they were ultimately entrusted to the Shrine of the Book Foundation. They have been on display in the Shrine of the Book at The Israel Museum, Jerusalem, since 1965. Over the next few years, from 1949 to 1956, additional fragments of some 950 different scrolls were discovered in ten nearby caves, both by Bedouins and by a joint archaeological expedition of the École Biblique et Archéologique Française and the Rockefeller Museum, under the direction of Professor Father Roland de Vaux. The richest yield, from Cave 4, just opposite the site of Qumran, consisted of some 15,000 fragments. The last cave, Cave 11, was discovered in 1956, and the scrolls found there were in a reasonable state of preservation. Since then, only a few small scraps of parchment have been found in the Judean Desert (though not in the close vicinity of Qumran). Apart from the first seven scrolls, which are entrusted to the Israel Museum, the majority of the fragments found by archaeologists and Bedouin are property of the Israel Antiquities Authority (IAA). Others are in the possession of institutions outside of Israel, such as the Jordan Archaeological Museum in Amman and the Bibliothèque Nationale de France in Paris, or in private hands (the Schøyen Collection, Norway). The Great Isaiah Scroll (1QIsaa) is one of the original seven Dead Sea Scrolls discovered in Qumran in 1947. It is the largest (734 cm) and best preserved of all the biblical scrolls, and the only one that is almost complete. The 54 columns contain all 66 chapters of the Hebrew version of the biblical Book of Isaiah. Dating from ca. 125 BCE, it is also one of the oldest of the Dead Sea Scrolls, some one thousand years older than the oldest manuscripts of the Hebrew Bible known to us before the scrolls’ discovery. The version of the text is generally in agreement with the Masoretic or traditional version codified in medieval codices, such as the Aleppo Codex, but it contains many variant readings, alternative spellings, scribal errors, and corrections. Unlike most of the biblical scrolls from Qumran, it exhibits a very full orthography (spelling), revealing how Hebrew was pronounced in the Second Temple Period. 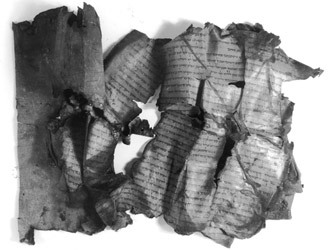 Around twenty additional copies of the Book of Isaiah were also found at Qumran (one more copy was discovered further south at Wadi Muraba’at), as well as six pesharim (commentaries) based on the book; Isaiah is also frequently quoted in other scrolls (a literary and religious phenomenon also present in New Testament writings). The authoritative and scriptural status of the Book of Isaiah is consistent with the messianic beliefs of the community living at Qumran, since Isaiah is known for his prophecies of judgment and consolation, and his visions of the End of Days and the coming of the Kingdom of God. 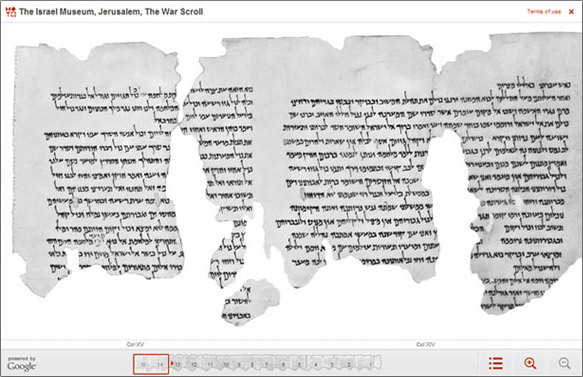 The War Scroll (1QM), popularly known as “The War of the Sons of Light Against the Sons of Darkness,” is one of the seven original Dead Sea Scrolls discovered in Qumran in 1947. It contains 19 columns (originally there were at least twenty), of which the first 14–19 lines (out of at least 21–22) are preserved. The work is written in Hebrew in a square Herodian script and is dated to the late first century BCE or early first century CE. Seven additional fragments (4Q491-497) with similar contents have also been found, but the relationship between these texts to 1QM is not entirely clear; they may represent an earlier version of the War Scroll, or source materials on which the War Scroll was based. Against the backdrop of a long biblical tradition concerning a final war at the End of Days (Ezekiel 38–39; Daniel 7–12), this scroll describes a seven stage, dualistic confrontation between the “Sons of Light” (the term used by Community members to refer to themselves), under the leadership of the “Prince of Light” (also called Michael, the Archangel) – and the “Sons of Darkness” (a nickname for the enemies of the Community, Jews and non-Jews alike), aided by a nation called the Kittim (Romans? ), headed by Belial. The confrontation would last 49 years, terminating in the victory of the “Sons of Light” and the restoration of the Temple service and sacrifices. The War Scroll describes battle arrays, weaponry, the ages of the participants, and military maneuvers, recalling Hellenistic and Roman military manuals. This work is not, strictly speaking, an apocalypse (namely, a heavenly revelation), and it lacks a “messianic” figure. Certain details, such as the advanced age of the combatants and the leadership of the priests, point to the idealistic nature of the war described in the work and impart a fictional quality to the treatise. Nonetheless, the War Scroll may indeed reflect genuine political tension in Judea between Romans and Jews, which would culminate in the outbreak of revolt in 66 CE. The scroll also sheds light on the New Testament Book of Revelation, in which a final war is also described between earthly and heavenly forces. The Temple Scrolla (11Q19) was almost certainly discovered in 1956 in Cave 11, located about two kilometers north of Khirbet Qumran. The manuscript is written in Hebrew in the square Herodian script of the late Second Temple Period (the first half of the first century CE), on extremely thin animal skin (one-tenth of a millimeter), making it the thinnest parchment scroll ever found in the caves of Qumran. Two other copies of the same composition have also come to light: one in Cave 11 (Temple Scrollb [11Q20]), and another (possibly a fragmentary copy of the last part of the work) in Cave 4 (4QTemple Scrollb [4Q524]). Most scholars believe that all three manuscripts are copies of an original work composed in the Land of Israel in the second half of the second century BCE (after 120 BCE, perhaps during the rule of John Hyrcanus I). The Temple Scrolla consists of 18 sheets of parchment, each of which has three or four columns of text. The scroll’s total length is 8.146 meters; it is thus the largest scroll ever discovered in the Qumran caves. 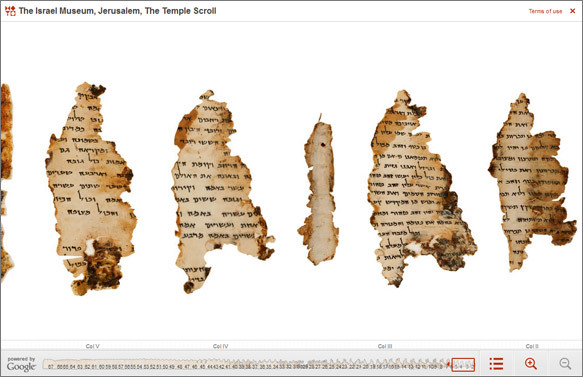 Its second half – the inner portion of the scroll – is better preserved than the first. The work claims to provide the details of God’s instructions (to Moses?) in regard to the construction and operation of the Temple. It was evidently supposed to be a kind of “new Book of Moses,” which systematically combines the laws of the Temple and the sacrifices (mainly from the books of Exodus, Leviticus, and Numbers) with a new version of these laws as articulated in Deuteronomy chapters 12–23. The Temple compound, as described in the scroll, was to be arranged in three concentric square courts, meant to resemble the camp of the Israelites in the desert. Just as the Tabernacle stood at the center of the Israelite camp, so too the utopian Temple was to stand at the center of the inner court, with the altar for burnt offerings and other objects near it, radiating its holiness to the whole of the Jewish People and the Land of Israel, as the Tabernacle did in the time of the Israelites’ wandering in the desert. A central question relates to the social provenance of this work: While the scroll shares many features in common with the other sectarian works discovered in the caves near Qumran, several representative expressions, such as the phrase “Sons of Light,” and concepts, such as the belief in predestination, are lacking. Many scholars still attribute the Temple Scroll to the isolated community living at Qumran. But others reject any connection with the Qumran community, affirming that the work originated in certain priestly (possible Zadokite) circles, and that the scroll was hidden in the cave by priestly Zealots during their flight from Jerusalem, before its destruction by the Romans in 70 CE. 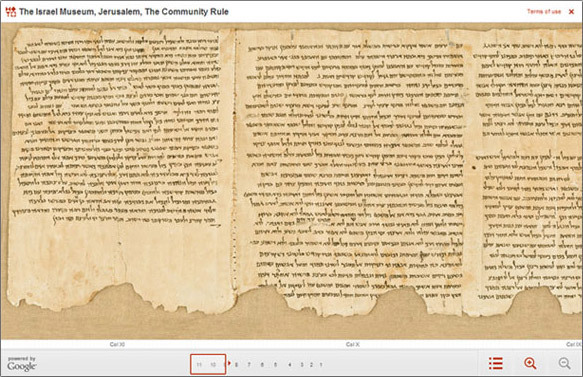 The Community Rule (Serekh Hayahad, 1QS), formerly called the “Manual of Discipline,” is the major section of one of the first seven scrolls discovered in Cave 1 at Qumran in 1947. Written in Hebrew in a square Hasmonean script, it was copied between 100 and 75 BCE. In addition to this manuscript, fragments of no less than ten additional copies of the work were found in Cave 4 (4Q255-264), and two tiny fragments of another copy came to light in Cave 5 (5Q11). The copy from Cave 1 is the best preserved and contains the longest version of the text known to us. On the basis of comparison with the fragments from Cave 4, however, scholars have concluded that the manuscript from Cave 1 represents a late stage in the evolution of the composition. The Community Rule is a sectarian work, crucial for understanding the Community’s way of life. It deals with such subjects as the admission of new members, conduct at communal meals, and even theological doctrines (such as the belief in cosmic dualism and in predestination). The picture that emerges from the scroll is one of a communal, ascetic life governed by rigorous rules, which transformed the members of the Community into “priests in spirit,” who lived sacred lives in a “spiritual temple.” The Community members patterned their daily lives in symbolic imitation of the lives of the priests serving in the Temple by praying and performing ritual ablutions, thereby acting in blatant opposition to the “defiled” physical Temple in Jerusalem. 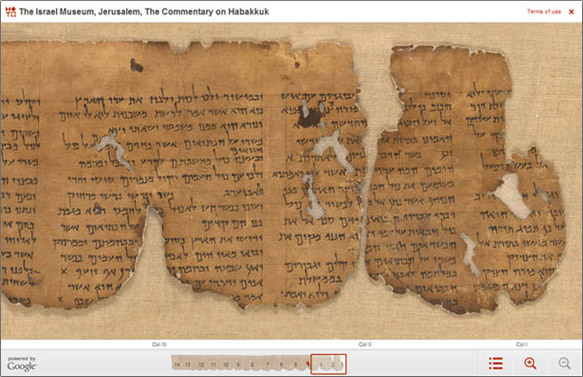 The Commentary on Habakkuk (Pesher Habakkuk, 1QpHab), is a relative complete scroll (1.48 m long) and one of the seven original Dead Sea Scrolls discovered in caves of Qumran in 1947. 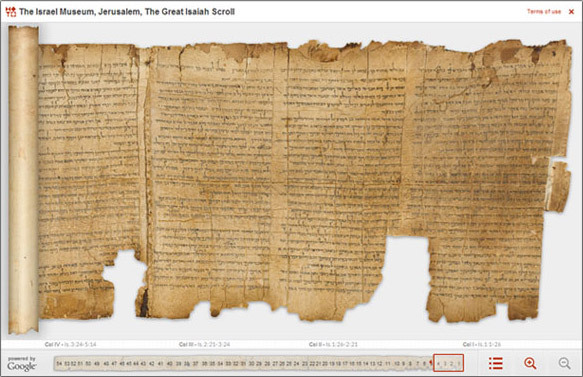 It interprets the first two chapters of the biblical book of the prophet Habakkuk and comprises 13 columns written in Hebrew, in a clear, square Herodian script. However, the tetragrammaton, the four-letter, ineffable name of God, is written in ancient Hebrew characters, unlike the rest of the text. The scroll has been dated to the second half of the first century BCE. In this work, the verses of the biblical book are copied paragraph by paragraph, in their original order. The scriptural text of Habakkuk on which the commentary is based, however, appears to be at variance from time to time with the Masoretic text. Each paragraph is accompanied by a commentary, introduced by the Hebrew word pishro, “its meaning,” or pesher hadavar al, “the meaning of the matter is in regard to.” The commentary uses a prophetic style to address events of the author’s time. Two major subjects are treated in this composition. One relates to the internal religious politics of Jerusalem and the Temple priesthood, and the other – to the repercussions of the appearance of the Romans (called in the work Chaldeans or Kittim) on the historical scene. As in most of works of this genre, no historical personages are mentioned by name, but there are allusions to such individuals as “the Teacher of Righteousness,” “the Wicked Priest,” “the Man of Lies,” and others, whose exact identities have yet to be established. Why the Textus Receptus (Byzantine) is older than Westcott & Hort Text (Alexandrian and Vaticannus ) The Ante Nicene Fathers (Polycarp, Tranacus, Etc.) Give an indelible stamp of Authority that Manuscripts of TR predate A&B 100-125 years. Textus Receptus (Latin: “received text”) is the name subsequently given to the succession of printed Greek texts of the New Testament which constituted the translation base for the original German Luther Bible, the translation of the New Testament into English by William Tyndale, the King James Version, and most other Reformation-era New Testament translations throughout Western and Central Europe. The series originated with the first printed Greek New Testament, published in 1516—a work undertaken in Basel by the Dutch Catholic scholar and humanist Desiderius Erasmus. Detractors criticize it for being based on only some six manuscripts, containing between them not quite the whole of the New Testament. The missing text was back-translated from the Vulgate. Although based mainly on late manuscripts of the Byzantine text-type, Erasmus’s edition differed markedly from the classic form of that text, and included some missing parts back translated from the Latin Vulgate. The Ante-Nicene Fathers, 10 vols. is before the RCC and before the text ( manuscripts ) become corrupt. End of the 3rd century the first 6 books. Westcott and Hort Text was found in the 325+ AD. This means that Tertullian was before these perversion were found. Can we prove that Mark 16:9-20 is actually in the scriptures? Yes we can because Tertullian references it!